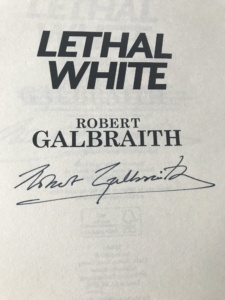 You now have the chance to win a SIGNED COPY of the fourth Strike novel Lethal White by Robert Galbraith (aka J.K. Rowling) through our new StrikeFans.com giveaway! All you have to do is comment on this post to enter the giveaway. You may enter only once. We’re very sorry to say this giveaway is available to those residing in the UK and Ireland only. The giveaway will end on the 24th of October at midnight (GMT). Legalese for giveaway: No purchase necessary to win. The winner will be chosen via random drawing at the end of the promotion period. You may enter the contest only once. Open only to residents of the UK and Ireland. Information is requested at the time of entry for the sole purpose of notifying winner and mailing prize to winner. By participating in this promotion, participant waives all rights to claim punitive, incidental and consequential damages and attorneys’ fees. Next Career of Evil Nominated for National Television Awards! Cannot wait to get my little hands on it and get to walk through these new written adventures Jo imagined! Thanks for the chance to win. Really hope luck is on my side for this one. Loved this book. Would love this copy even more! Such a fantastic novel – amazing giveaway! What a wonderful prize. Good luck everyone! I have so many favourite chapters in this novel that I want to revisit, even after two complete readings! I’m dying to read this book, the other three are amazing, and I’m sure this one won’t disappoint! I have already read this book and loved it. The only thing that could enhance the experience is owning a signed copy. A signed copy of Lethal White would be a treasured possession that I would pass on to my children, and their children (when they are old enough to read it of course!) Ha! Love the series and a signed copy of Lethal White would be amazing. My favourite book of 2018! I love the books and it would make my day to win a signed copy! Would love to add this to my collection. Thank you for the chance! Brilliant hope to win it for my mum! Fantastic book. Absolutely love the series, hoping Robert has a good few more in him yet! I loved all of the previous books and the TV adaptations of them. I would be over the moon to win a signed copy of Lethal White, it would make my year! I just hope in the next one Robin and Strike finaly get it together! But maybe I dont care as long as there is a next one! Will read the previous three for the third time…to set the mood. What an amazing giveaway for you guys, I was treasure this book if I won. Darn it! I’m from Mexico, I wish I could participate soon for a worldwide giveaway. Loved the other books and have just started to read Lethal White and I’m already gripped. Can’t wait to see how the story unfolds. Waited so long for the next episode in this series and so not disappointed. It’s a real page turner. Unfortunately I have to put it down at work and to sleep but I’m loving it so far. The characters in my head are the ones I’ve watched on tv now but I’m very happy with that. And that’s unusual for most to adaptations. Can’t even begin to think how it’s going to end and that’s what I love. Thanks for a great book. I really hope I win this!! It would be a great gift to my twin sister!! Love the pairing of Strike and Robin. Would love to read it before it comes out on TV! Love ALL the books so much! Awesome give away! My wife and I are huge fans. Not finished the book yet. Looking forward to though. What a great giveaway! Can’t wait to get started on Lethal White!! Escribo sólo porque son una fan de Cormoran Strike, aunque sé que no puedo ganar. Saludos a todos y les deseo mucha suerte desde Ecuador. I would love this as I’ve not read it yet! To have it signed as well, it would be amazing! Thank you Robert Galbraith for another wonderful story to lose myself in. I love every minute I’m in it. Would absolutely love a signed copy of the book! Enjoying this book even more than previous ones as it concentrates more on the characters as well as having a complex plot. Strike is a classic. Might as well light a candle and try! I’m in the middle of reading my unsigned copy, would go bananas for a signed edition :D.
Finished the book last week. As I borrowed it from the library, would love to win this copy! Anyone else want to smack Matthew with a wet kipper? These characters are awesome – such power and electricity, unlike anything I have read before! Strike and Ellacot – dynamic duo! I so want to read this! I have to know what happens next for Robin and Cormoran! I enjoyed the book so much! I was sad when it was over. Read the first book in the series on my Kindle, waaaay back in 2013! Love getting immersed with each new story. Need book 5 now! hope it’s the equal (or better) of the previous fabulous “Strike” novels ? Like a great band that gets better with each new album Mr Galbraith has exceeded himself once again. I care about Cormoran and Robin more than some couples in my own family. I love this series. Cormorant and Robin’s relationship gives a great undercurrent to a the series. Thanks for a series that has seen me through some pretty rubbish health times. A good book takes my mind of it and these books definitely have. Listening to the book at present – a signed copy would make an excellent present for my wife. Just started reading it. Already very good. Bought it at Waterstones hard back, the previous 3 via kindle. Would love a signed version. I’ve read the ebook, I’ve read the hardcover, but how amazing would it be to have a signed copy for my third read? I’ve read the ebook, but…. a hard copy will be loved for sure. Loved this book- the best ‘Strike’ book to date! Of course, I already have a copy, but to win a signed copy… fantastic! A brilliant book from a brilliant writer. I loved every page of it but especially a certain scene regarding a certain woman leaving a certain man. And the end… I couldn’t see it coming! Can’t wait for book n. 5! Brilliant giveaway! I loved the book, a signed copy to complete my collection would be amazing! Would love to win! Fingers crossed!!! Would love to win a signed copy for my dad for Christmas as he is a massive fan! I’ve just finished my second read of Lethal White. I galloped through it the first time and took my time with it the second, and enjoyed both times immensely. Next plan is to read all four again in order as the autumn rolls in. I’m thoroughly enjoying the character developments and the mysteries unfolding. Pure magic! It was hard to finish one… I didn’t want to let it go. I love this series so very much. I can’t remember looking forward to reading something so much. Adore these books, had mine on pre-order, reading it very slowly as I won’t be able to bear having to wait for the next one! Already read the book but this would take the prime display spot on my shelf. Love this series and love the TV series too. There is something so down to earth about the characters and stories that set it aside from other books. Look forward to reading this one, and hopefully more to follow. 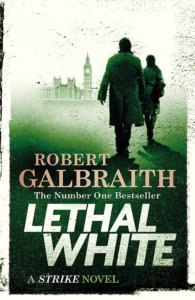 Does anybody know when Lethal White will be published in paperback? I’m not really a fan of reading hardback books but of course could make an exception for a signed copy! Wow, great prize. Please add me to the draw! I think the winner should be me this time! I am an Audible listener and am thoroughly enjoying the twists and turns that this tremendous book offers, the collaboration and tension between Strike and Robin is palpable and the strands of intrigue are woven together so well, brilliant. Please please write another and another………. I have a new newpbew – his name is Eric – after Eric Wardle perhaps ? Not really, Eric Cantona – But, it’s a brilliant prize – Good luck all !! Would be so amazing to win this. I’d been checking the Twitter pages of J K Rowling and Cormoran Strike every day to find out more about the release of Lethal White . I’m enjoying every moment of reading it. I think a signed copy would be the best Birthday gift ever. I love the whole series and would love to win this! I want to be Robert Galbraith when I grow up. Love this series and Lethal White has reached a whole new level of character development and plot twists! More addictive than Class A drugs. I need my next fix! Loved the book, a signed copy would be fabulous!! What a great prize!! A great book. Especially the parts set in East Ham! Both Robin and Strike are such compelling characters. Love the series! This book has made me down tools and read when I really should be doing other things, brilliant! Don’t want it to end! !